Reverend Harold Lafayette Dugger, Sr., a native of Waverly, VA, is the sixth of nine children born to the late Reverend Sidney Dugger and Reverend Ellen Dugger. At an early age, he moved to the Washington Metropolitan Area. He is a graduate of the District of Columbia School System. At the age of twelve, Reverend Dugger accepted Jesus Christ as his Lord and Savior. He answered God’s call to ministry at the age of eighteen. On July 19, 1979, Reverend Dugger preached his initial sermon at Peace Baptist Church. Under the leadership of Reverend Arie L. Mangrum, Jr., he served as an Associate Minister. Reverend Dugger is a graduate of both The Washington Baptist Seminary and Faith Christian University and Schools where he received a Bachelor’s Degree in Theology and Biblical Studies, respectively. In December 2008, Rev. Dugger earned a Continued Education Diploma in Pastoral Ministry from the Baptist Theological Seminary of Zimbabwe by way of the Lott Carey Baptist Foreign Mission Convention’s Pastoral Excellence Program. This diploma was bestowed upon him after having completing three years of preaching, teaching, counseling, theological reflections and perspectives in Guyana, South America, Jamaica, West Indies and South Africa. Reverend Dugger was united in the covenant of marriage to Ms. Odelia Tate on August 9, 1986. They have been blessed with three beautiful children: Briana, Sydney and Harold, Jr.
Reverend Dugger has devoted more than thirty years to the work of ministry. During his tenure as an Associate Minister at Peace Baptist Church, he served as a skilled preacher and teacher of the Word of God. He gave leadership to the Youth, Men’s, Outreach and Prison Ministries. Reverend Dugger has been instrumental throughout the Washington Metropolitan, Maryland and Virginia areas preaching, teaching, visiting the sick and ministering to the disenfranchised. Currently, he serves as a liaison and advisor to the Mayor of the Town of Capitol Heights. He was ordained June 19, 1999 at Peace Baptist Church under the leadership of Reverend Dr. Michael T. Bell. 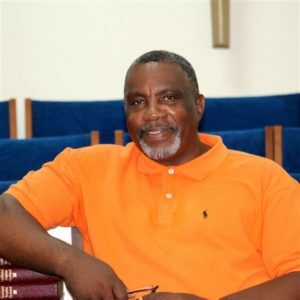 In August of that same year, Reverend Joseph Weaver of First Baptist Church of Capitol Heights (FBCCH) appointed him to serve as Associate Pastor. On October 29, 2000, Reverend Dugger was elected and appointed as Pastor to this branch of Zion. Under his leadership, First Baptist Church of Capitol Heights has flourished! Reverend Dugger has set forth a vision founded on the “Five E’s” – to Evangelize, Educate, Equip, Engage, and Expand! Since the inception of his tenure, First Baptist has been well on its way to bringing this vision to reality. Properties surrounding the church have been strategically purchased, setting the groundwork for future building projects, and the development of other venues for teaching and outreach. In anticipation of the future harvest, certain provisions have been made for worship and parking. Under Reverend Dugger’s leadership, the Food Ministry of FBCCH continues to meet the needs of the surrounding community providing food and healthy nutrition essentials for the physical and spiritual man. 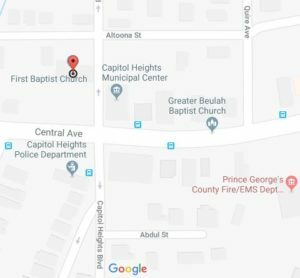 First Baptist Church of Capitol Heights also supports and provides outreach ministries to neighboring shelters, schools, nursing homes and other venues. The foundation for outreach and evangelism ministry has been established and extends to other ministries such as Prison, Singles, Women’s, Men’s and Youth Ministries.